6 We've Carried The Rich For 240 Years! Let's Get Them Off Our Backs! 9 BRING THEM HOME NOW! 17 "BILL FLETCHER JR, ED OTT & OTHERS"
Dennis O'Neil... is a leading member of the Freedom Road Socialist Organization. He is a retired postal worker. and is the partner of Dody Clarke. In 1969 Dennis Adams O'Neill age 19, from the Bronx, New York, was a member of the first Venceremos Brigade to Cuba. Dennis O'Neil was a member of Students for a Democratic Society in New York with Mickey Jarvis. The FBI took this 1973 shot of Dennis O'Neil for their files. 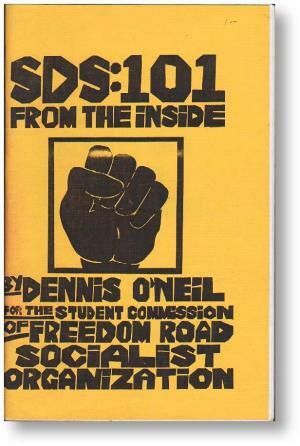 Dennis O'Neil was a founding member of the Revolutionary Communist Party, and helped draft the RCP’s first programme, adopted in 1975. I left in the 1978 split that formed the Revolutionary Workers Headquarters. I am still a Maoist and remain active in a revolutionary socialist group, the Freedom Road Socialist Organization. In 1996 Martha Cameron, Dennis O'Neil were the editors of Forward Motion, the journal of Freedom Road Socialist Organization. In July 2007 Dennis O'Neil representing Bring Them Home Now Campaign was affiliated to United for Peace and Justice. O'Neil is a member of the Freedom Road Socialist Organization and active in the War Moratorium project. To be sure, the people of Ferguson were lucky to have veteran local organizers, especially the radicals of the Organization for Black Struggle, on the ground, helping build the fightback. Even some of those who were drawn from elsewhere to help (as distinct from paper-peddling riot tourists) made contributions. But it was the residents of Ferguson and surrounding communities who deserve the credit. So what do we do now? By we, I mean first and foremost reds, revolutionary socialists (and my comrades in the Freedom Road Socialist Organization in particular), but I include as well anyone who was outraged by the Ferguson murder and wants to insure that this wave of anger and protest does not recede entirely in the months to come. Jon Levine is with Bill Fletcher, Jr. and 28 others - Richie Chevat, Francy Caprino, Ellie Gitelman Bagli, Mindy Gershon, Ajamu Dillahunt, Steve Backman, Dennis O'Neil, Martha Cameron, Glen Ford, Stan Goff, Sean Crimmins, Nat Turner Bender, Dave Blalock, James Carey, Larry Hamm, Sally Davidow, Bert Barao, Joe Fine, Bella August, Richard Cammarieri, Jeff Crosby, Sidney Brown, Carol Fine, Charles Bagli, Willa Cofield, Carmen Berkley. Thanks to Alfreda Coachman Daniels for sharing this 40 year old historic photo from a 1976 anti-busing rally in Boston. Shaun King, from whom Ms. Daniels shared this blast-from-the-past photo, commented "The American flag may represent freedom to you but it meant something else to this man." "BILL FLETCHER JR, ED OTT & OTHERS"
Left Labor Project held a forum at 1199 SEIU, 310 W 43rd St, 14 January 2016, 18:00 till Thursday 14 January 2016. The run-up to the Presidential primaries has unleashed a right-wing frenzy that's unprecedented in its naked scapegoating and repressive policy ideas. How do we analyze and respond to these developments, through our labor and community groups, and in the electoral arena? What new alliances, campaigns, and demands do we need? In February 2016, Jeffrey Lichtenstein with Mary Jo Connelly and Cazembe Jackson Jasmine Wallace, Thomas Wayne Walker, Karly Safar, Dennis O'Neil, Anjie Martian-Princess were selling an "Organize the South" poster on the Freedom Road Socialist Organization Facebook page. Those indicating interest in attending, on Facebook included Dennis O'Neil . 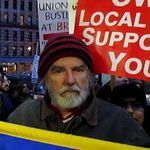 Members of the Upper Manhattan/Bronx Democratic Socialists of America, closed Facebook group, as of October 15, 2017 included Dennis O'Neil . Members of the New New York City Democratic Socialists of America Public Facebook Group, as of June 27, 2018 included Dennis O'Neil. ↑ LLP "BILL FLETCHER JR, ED OTT & OTHERS"
This page was last modified on 9 March 2019, at 13:49.